Yebo run projects in Uganda, supporting children from an orphanage and also the children that live on the streets in Uganda, near Kampala, the capital. This has been a challenging project for us. Volunteers organised by Yebo go out to Uganda to stay at UWEC (The Ugandan Wildlife Education Centre) and work together with the centre, Ngamba Island Chimpanzee sanctuary and an orphanage to support the children through primate conservation. To educate the children we wanted to come from a different angle to sitting in a classroom. Our aim was to relate human behaviour and life experiences such as trauma to that of primates ((specifically chimpanzees) our closest relatives. We did this by running activities with the support of the staff at UWEC. 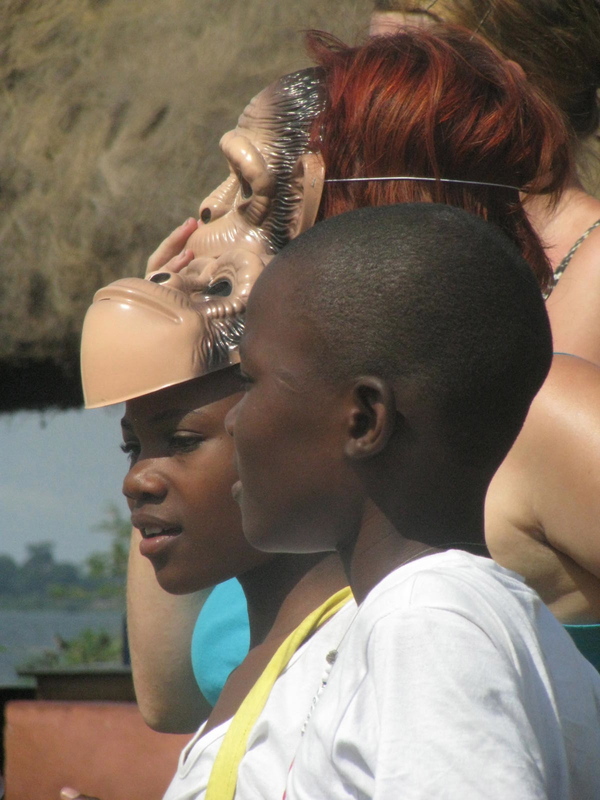 The children took part in creative art activities whilst seeing the chimpanzees at the centre. In their activities they were invited to express their feelings and life situations in a safe and non intrusive environment, comparing the similarities but also the difference s to the traumas and feelings that the chimpanzees have been through. 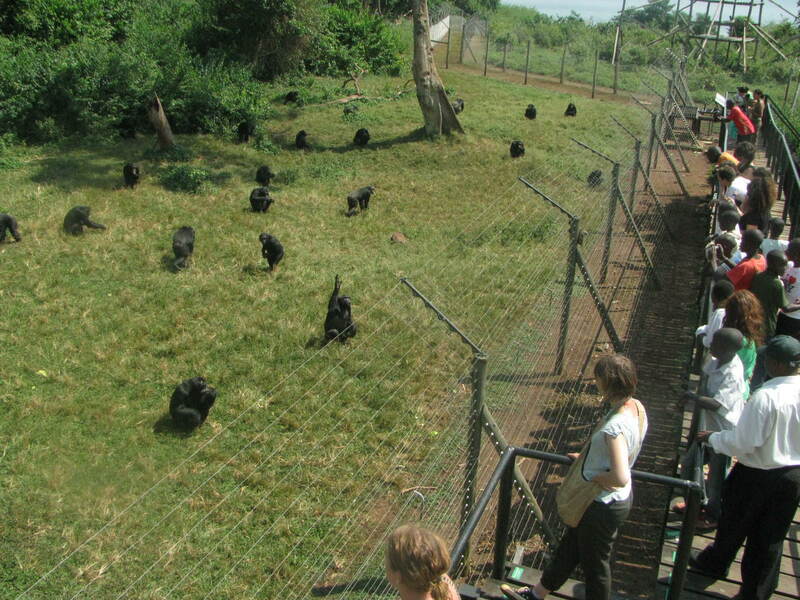 For example, many of the chimpanzees at both the UWEC centre and Ngamba island are there as they have been through traumas in their lives such as coming from animal testing laboratories where they may have been taken out of the wild away from their mothers at a young age. They would have been abused through the result of the experiments that they have been used for. Some may have been taken in because in the past they have been taken from their mother to sell on as pets, cute and cuddly like a human baby to begin with but getting older and stronger everyday. The chimps can be abused for this and the chimps also display signs of PTSD (Post traumatic stress disorder) The behaviors that the chimps present with can often then be related to how the children may be feeling. During visits to the sanctuary, the children are provided with a good meal and fresh drinking water and the chances to learn and have educational experiences . This project can also be related to primate conservation which we support alot, by the children realising the devastating affects of destroying chimpanzees homes in the wild through illegal logging and the destruction of the forests where they live , again, relating this to how the children may have lost their homes and are living a dangerous life on the streets. We try our best to then run outreach projects where the in country coordinators who are staff at the sanctuaries are running the projects when our volunteers are not out there by Yebo funding these for them. This has also proved successful as the people who live in Uganda are the ones that can also relate to the children and understand the challenges that the country is going through. This is one of the projects we have created, along with others that are being developed at the moment.